Online files storage services make storing your files in the cloud and make it accessible anywhere. I use plenty of services like Google Docs, Windows Live Skydrive, Box.net, etc. Some of the most popular services where you might be storing your files are Google Docs, Amazon S3, Windows Live Skydrive, etc. But, at best they are digital islands and you could access them via browser or through some special tools. Gladinet is a tool that lets you mount these online storage as a virtual drive in your computer. This lets you access these files with Windows Explorer enabling you to drag and drop files in your very familiar interface. Add online web applications such as Gmail, Gtalk, Picasa, ThinkFree, etc. Gladinet’s tagline ‘Access Without Boundaries‘ is a fitting description of what this service is. It goes beyong letting you mount online services to your local drives. It blurs the distinction between local files and web applications, etc. 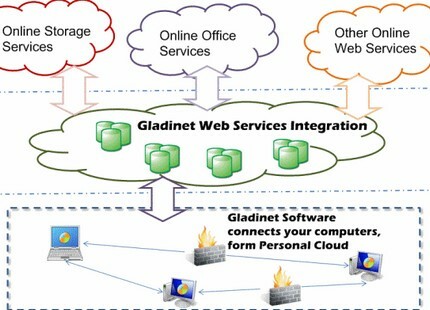 Gladinet is definitely a great and promising service that I am going to keep my eyes open for. It provides that integration that has been missing between my desktop and the various online services I use. There are a few more extras you could get with upgrading to their standard version. All the above features are available with the free standalone version of Gladinet. And you don’t even need to register for an account! The online storage as virtual drives is great as I can dump all my music files to my Windows Live Skydrive that has 25GB free space! Leave a comment if you try this awesome service and I’d love to hear your feedback. Too cool! I haven’t tried it out yet, but it looks really interesting. I tried to use Gladinet. Really, I do not quite understand how it works. I will understand. I tried using it but I ran into problems when I tried connecting it to Skydrive. I have a hard time trying to uninstall it from my system. Google DOCS and Picasa work. I think I will hold out a bit until a later version fix the skydrive bug. Cloud computing is going to be the next big thing, at least according to Google and Microsoft. What? It works only with explorer, what about firefox and opera? Gladinet is the next tool which i am left with…Presently I am using Google docs to store even a large files so that everyone can access..
What’s the file sharing side like? Does it let you share to selected groups or is it “all or nothing” when it comes to sharing? My online storage site of choice is http://www.MyOtherDrive.com because they let me share privately. I can record a movie of my kids, share it to my ‘family’ group and only they see it. I can also make some limited content truly public. And of course I can keep most of my files private. It was not clear to me if they offered this advanced level of sharing. I also could not tell if I can upload once and then “push” content to others (as well as received “pushed” content). MyOtherDrive has this capability – upload once and then move the files around “on the backend.” Very bleeding edge cool. Sounds nice, but can this last? I remember some tool like this came out for gmail back in the days (for storage online only), and soon after, it stopped working and no one fixed it. I hope this one will be kept up to date so that it can be used without fail. Interesting. How does GladiNet compare with the likes of Mozy, Carbonite, SpiderOak, IBackup or ElephantDrive. Have you tested any of the Amazon S3 enabled packagesd? BackBlaze, JungleDrive, CloudBerry? .-= Steve´s last blog ..ContentCube =-.